There are some foods that simply don’t get enough homemade love. In other words, it often seems more normal (and traditional) to eat and enjoy said foods outside of the home. Let’s take soft pretzels, for example. With companies like Auntie Anne’s at basically every mall and the popularity of food trucks and festivals, buying fresh, warm soft pretzels from a vendor feels like the norm. (Well, it did for me, at least!) However, when I set out to make a new set of recipes with Nature’s Earthly Choice‘s Apple Flour Baking Mix, I decided to challenge myself and make soft pretzels for the first time. 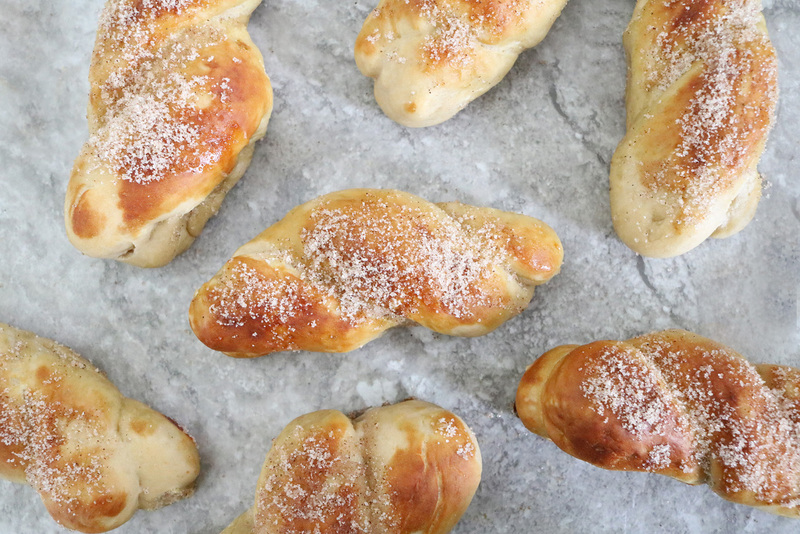 After some experimentation, I ended up with a fresh batch of deliciously fresh cinnamon sugar soft pretzel twists. The verdict? I am never (ever) going back to the store-bought stuff again. Here’s how to make them yourself. 1. In a small pot, warm the milk. Do not let it boil.Pour the milk into a large bowl and sprinkle in the yeast. Let stand until the yeast becomes puffy, about 3 minutes. 2. To the milk and yeast mixture, add the olive oil, brown sugar, salt, and 1 cup of apple flour. Mix well, then slowly add the remaining 1 ¼ cups flour until a sticky dough forms. 3. Lightly dust your hands with flour. Knead the dough on a floured surface until it is smooth yet tacky to the touch. Gradually add more flour if it is too sticky. 4. Place the dough in a greased bowl. Cover with a damp kitchen towel and let sit in a warm area until it doubles in size, about 1 hour. 5. Pre-heat oven to 450 degrees Fahrenheit. Deflate the dough with a few gentle punches then place on a floured surface. 6. For each twist, form two golf ball-sized pieces. Roll and pull to form short ropes then twist together. Repeat until you have 8 pretzel twists. 7. In a shallow dish, add the baking soda to 3 cups of warm water. Stir until dissolved. Lightly dip each pretzel into the mixture, then place on a greased baking sheet. 8. Bake for 10 to 12 minutes or until lightly golden. In a small bowl, combine the sugar and cinnamon. Brush each pretzel with melted butter and dip into cinnamon sugar. Serve immediately. Homemade soft pretzels are surprisingly easy to make, too. And I am obsessed! Of course, like all homemade food, you can personalize the recipe with your favorite toppings. Nothing beats the classic butter and sea salt, but something tells me savory ingredients like basil and oregano would be awesome. Or how about coconut flakes and dark chocolate chips? Yes please.